It’s hard to believe it’s that time of year again, with the holidays fast approaching and our mailboxes (both physical and digital) becoming overly stuffed with promotions & catalogs. No joke, I got 9 catalogs in one day last week! It also happens to be the time we all take stock and think “What will be on my holiday wish list this year?” - if you are anything like me, that wish list always starts with turning to the kitchen. I am a huge proponent of a lean kitchen, stocking only the necessary items and doing my best to not fall into hoarding the latest tools promising to save time and energy - but, every so often, a new product comes along that makes me take note. Enter Ballarini, the Italian cookware company founded in 1889 in the rolling hills of northern Italy. Now, we all know how delicious the food of Italy is, and with this cookware in their arsenal, it is no wonder Italians have such a strong heritage with food. Originally founded as a metal workshop making a wide range of household items, Ballarini has become the leading experts and innovators within the world of non-stick cookware. As a purist, I have always been one to gravitate to my stainless cookware - but this pan has changed everything about how I cook. The innovative and revolutionary Thermopoint indicator tells me exactly when the pan is ready to go - which means, I will no longer play that guessing game, saying, ‘is it hot enough, is it not hot enough? !” Nothing is worse than starting with a pan that is not the right temperature. In addition to this amazing feature, the non-stick coating works like a dream, requiring very little oil and providing beautiful results each time. Further, Ballarini spends a lot of time and resources investing in reducing their carbon footprint and working to bring eco friendly innovation to the world of non-stick coating. 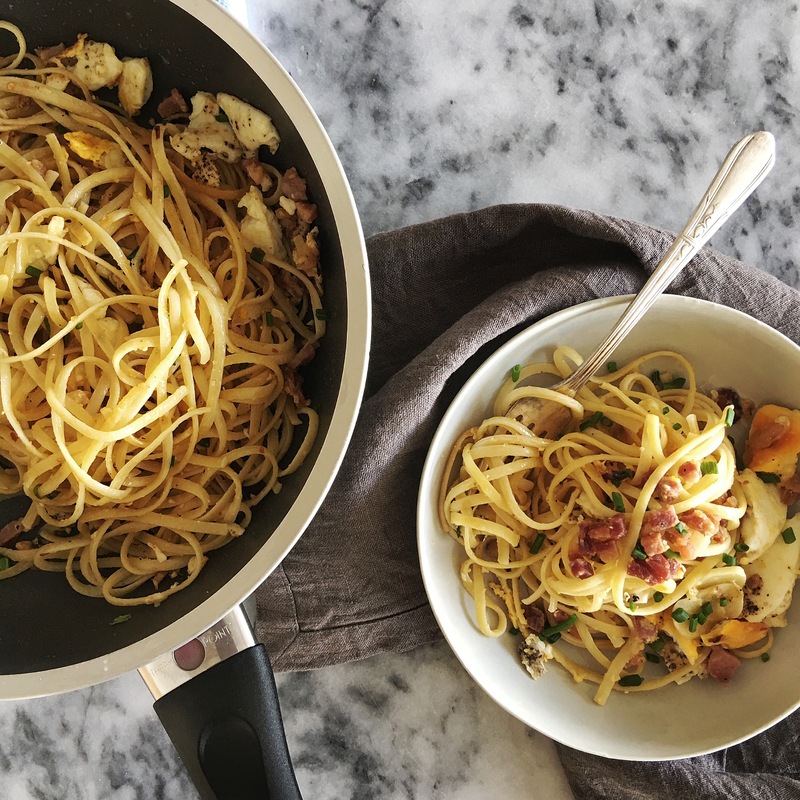 Obviously, with a piece of cookware so steeped in Italian Heritage, it only made sense that we test drive this pan with a pasta dish - one that is dead simple, something you can pull together in the time it takes to boil water and cook the pasta. Using this recipe as a foundation, I take a few liberties to embellish the dish to my own liking - layering in crispy pancetta for some saltiness & adding a hefty dose of black pepper and crushed red pepper for some heat. Feel free to make this recipe your own with modifications to fit your needs - or, start with the original, it is a great all-around easy dinner. Bring a large pot of salted water to a boil. 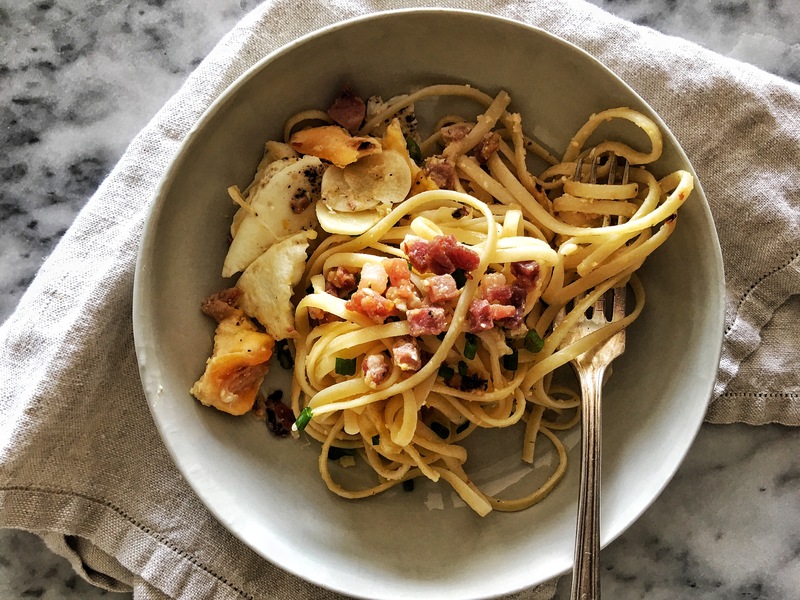 When the water comes to a boil, heat your pan over medium high heat and when hot, start cooking pancetta until the fat has rendered and the meat is crispy. Using a slotted spoon, transfer to a paper towel lined plate. Drain all but 1 tablespoon of the remaining oil. Turn heat under skillet to low, and add sliced garlic and saute lightly until the edges begin to turn golden (about 2 minutes). Add black pepper and crushed red pepper and saute for an additional 10 seconds. Transfer garlic to plate with pancetta. Adjust heat under skillet to medium, then crack 4 eggs into the pan and let cook until the whites have set and the yolks are still runny (about 5 minutes). At this point, the pasta should be al dente - drain pasta (reserving half a cup of the pasta water) and transfer directly to the skillet with the eggs. Working quickly, add the pancetta, garlic and cheese - toss to combine with the eggs. Add reserved pasta water (if needed) to help sauce come together. This post created in partnership with Ballarini - all opinions expressed are our own.